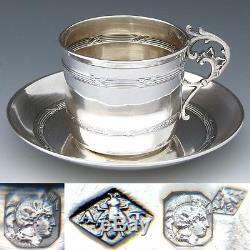 Antique French Sterling Silver Tea Cup & Saucer, Possibly Demitasse, c. Antique French Sterling Silver Tea Cup & Saucer, Possibly Demitasse Espresso Size, c. All items and photos are the express property of Antiques & Uncommon Treasure. No reproduction without prior written consent. We'll be sending out sale notices and special deals to our'Favorites' customers. Lovely antique French sterling silver tea cup & saucer, Classical fluting & crossed ribbon pattern with scrolling handle and wonderful condition! With a French Minerve #1 mark, we know this beautiful cop and saucer are guaranteed to be finest. About the size of a 19th century China tea cup, rare since the French weren't really known as being tea drinkers. This is not the extra large chocolate cup we sometimes offer, and isn't the other little demitasse or very small cup for espresso. Perfect for your own enjoyment, or to give as a special gift. Measurements noted on photos, but the set is about the same size as a fine old English china tea cup. Very good to excellent condition, I find no dents to mention and no flaws. We would put the date in the Belle Epoque era to as late as 1920, but not later. Yes, the Minerve #1 is on both pieces. Our photos are large and clear. We do expect our customers to review them all, evaluate the item based on both our description and our images. Thanks for all the compliments - we love what we do! Antiques & Uncommon Treasure - all the best, all the time! We're easy to deal with. Our fine inventory is very important. And your ranking of our performance is also very important! We wish to keep our 4.9 - 5 star ratings in all categories. We always insure our items BUT, more importantly, pack them extremely well knowing that most are not replaceable. Please remember that when leaving DSR ratings. Icon here or above to see more of our inventory, offerings and venues. We have a HUGE assortment of the finest antiques to be found online, all at your fingertips with Antiques & Uncommon Treasure. _gsrx_vers_631 GS 6.9.8b6 (631). The item "Antique French Sterling Silver Tea Cup & Saucer, Possibly Demitasse, c.
1890s" is in sale since Saturday, May 06, 2017. This item is in the category "Antiques\Silver\Sterling Silver (. The seller is "antiquesuncommontreasure" and is located in San Marcos, California. This item can be shipped worldwide.